This is the most fun Sukanya Verma has had since Wonder Woman. I can imagine Julie Andrews to do a lot many things. Sing like her life depended on it, play an airborne nanny at 17 Cherry Tree Lane or give the royals a run for their money. But a sea monster, I simply cannot. Up until I watched Aquaman that is and discovered DC's still quite capable of springing some pleasant surprises. Under the sea is where the action lies in the latest offering from the studio that makes us groan at the mention of Batman and Superman. Take Sebastian-the Crab's word for it -- Darling, it's better. Down where it's wetter. At nearly two-and-a-half hours, Aquaman is one lengthy joyride into the deep. Only it's so unstoppably fun that you don't mind the endless lark. 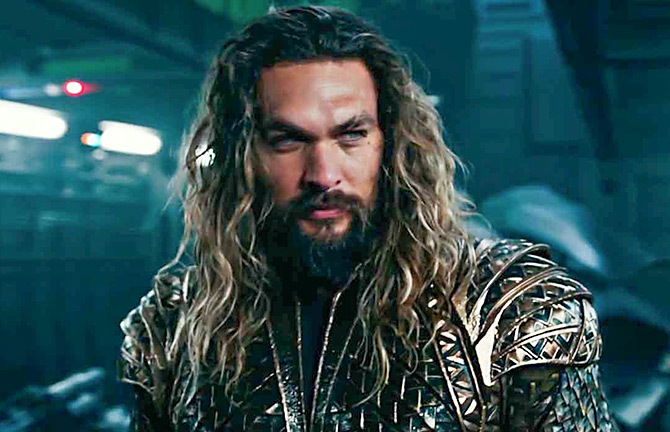 After showing off his scruffy swag in the middling Justice League, Arthur Curry aka Aquaman (a badass Jason Momoa) comes to the fore in an obligatory origins story. Given how factory-like the whole comic book movies universe has become, there's more scepticism than excitement towards such ventures. Director James Wan (Insidious, The Conjuring) comes in prepared and goes all out to dispel our apprehensions in a movie that breaks two of the most annoying rules plaguing DC movies, post Christopher Nolan's stint. It embraces both -- colour and cheesy humour. The screen is smattered with a riot of iridescent hues befitting an underwater fantasy that throws up visuals that evoke a wild mix of everything from Japanese anime and Tolkien to Avatar and Star Wars. Often CGI is limited to spectacle but in Wan's vision, it assumes a reality that lends its breathtaking view the quality of a long hidden treasure. For a good part, we discover Atlantis and several other mythical kingdoms through the enthralled eyes of Aquaman and his spunky guide Mera (Amber Heard, all grit and good looks). A redhead princess (think Brave's Merida, all grown up in green leotards) who prioritizes nationalism over making eyes while her father's (Dolph Lundgren) allegiance to the bad guy, Aquaman's half-brother Orm (a suave, snobby Patrick Wilson) and his Ocean Master aspirations prompts Thor-Loki face-offs over mommy (Nicole Kidman, ever so nimble) and throne. Adding to the nemesis count, there's Black Manta (Yahya Abdul-Mateen II doesn't make much of an impression) hating on Aquaman whose lack of mercy leaves him daddy-less. Keeping the balance is Willem Dafoe's sagely Vulco, an Atlantean Dronacharya and daddy figure to both Mera and Arthur. It's a terrific line-up of actors and action heroes and neither disappoint. Amidst all the infighting, endless back-stories and undersea diversity portrayed in exquisite costumes and resplendent production design, our hero reluctantly seeks an all-powerful trident to lay claim as king. Such 'put aside the ranger, become who you were born to be ardour as well as a great deal of its ethereal darkness and sly exchange brings to mind Peter Jackson's epic. The writing, of course, is far from solid. Wan's film is so comfortable in its absurdity; it has a blast with it. This is a live-action comic book that doesn't take itself seriously even when it's unleashing the ocean's wrath over humans polluting it. Parental, not environmental, concerns mark the conflict in the glibly written jaunt. Wan's joy in orchestrating battles around demi-gods riding sea dragons and giant crustaceans, trench monsters hijacking a ship in the middle of a raging storm and a virtually unrecognisable Julie Andrews strong arming a rockstar superhero prone to smirk his way through every obstacle ensure this is the most fun I've had at DC since Wonder Woman.